The Fall 2006 issue of China Review International (on Project Muse) contains a review of what looks to be a fascinating and comprehensive reanalysis of footbinding in China: Dorothy Ko's Cinderella’s Sisters: A Revisionist History of Footbinding (U. California Press, 2005). Here are some excerpts of the review (not the book itself). Patricia Ebrey argued years ago that the binding of women’s feet in Song times had less to do with the rise of neo-Confucianism and more to do with popular culture, economic developments, marriage customs, and even China’s relations with its nomadic neighbors. Ebrey pointed out that Chinese masculinity was redefined in the Song to be more refined and aesthetically sensitive, and less active, martial, and athletic than in earlier times. Such a redefinition of masculinity might well have required the parallel development of a new view of femininity that was softer, more delicate, and more effete than before. Footbinding was a way to construct femininity in this softer, weaker, more compliant vein. Ebrey also noted the Chinese reaction against the nomadic cultures on the northern and western borders as another possible factor in promoting the spread of footbinding that came to be seen as a marker of China’s unique civilization in contrast to its nomadic neighbors. On our first trip to Romania in 1983, we booked our reservations with an agency who knew what they were doing—Thomas Cook, I believe it was. We took the Orient Express from Paris to Bucharest. This time we bought our Eurail passes online and booked our reservations as we went along. Being well into middle age, we bought the First Class Saver passes (for groups of two or more people) good for 15 consecutive days of travel, which we planned for the first two weeks of January. Our first mistake was buying the passes from eurail.com, which offers no help with reservations after the sale. Other rail pass vendors, like railpass.com or eurail-pass.com or raileurope.com, will book reservations for people who bought passes from them. Commercial travel agents are not very interested in Eurail pass bookings for just a fraction of the small reservation fee; and national railway systems, even within the EU, may work well with their immediate neighbors, but not with national systems farther down the line. Romania is pretty far down the line from France. A helpful agent of the SNCF in Strasbourg booked us to Vienna (via Stuttgart and Munich), and gave us the timetable of an overnight train from Vienna to Bucharest, but could not reserve us a sleeping car. (The current Orient Express only runs between Strasbourg and Vienna.) The DB office in Munich had no problem booking us through to Bucharest. The DB certainly impressed us as the gold standard for train travel on both sides of the Atlantic, while Lufthansa similarly impressed us as the gold standard for air travel across the Atlantic, especially after they upgraded us to business class for our Xmas Day flight from Boston to Frankfurt (for no good reason, unless we looked like Herr Santa und Frau Klaus). On the 1983 Orient Express, we stayed in the same Wagon-Lit compartment both nights (between France and Germany and between Hungary and Romania), but we noticed a degradation in quality at each change of dining car. We enjoyed an excellent German breakfast in a spotless dining car as we passed through Bavaria the first morning. That evening we enjoyed a pleasant dinner in a clean Hungarian dining car as we headed for Budapest. The dingy Romanian dining car at breakfast was full of smokers drinking ersatzkaffee and plum brandy. Crossing the Hungarian border at Hegyeshalom around sunset the night before was memorable, but not nearly as traumatic as our wee-hour awakening at Curtici on the Romanian border, where we were asked to open our luggage and tell the officials if we had any bibles, dynamite, or typewriters—a dangerously subversive trinity. The only bright spot was that it was my first real chance to use Romanian since finishing Army language school in 1970. This year our trauma—and long-awaited dormant language revival—began much earlier, as we tried to find car 419 in the train awaiting us across the platform when we arrived at Wien Westbahnhof. We found car 420, then backtracked to 418, then 417, then forward again, then even farther back to—lo and behold—car 419. This was but the first indication that our train was not the Orient Express, but the Dacia Express (D 345). The second, third, and fourth indications were that the car attendant spoke Romanian, that he had to evict a hopeful squatter from our 2-berth compartment, and that the car was labeled vagon de dormit well as wagon-lit and carrozza letto. When I went looking for a dining car after the train got underway, I noticed that several of the outside doors were chained shut, and that chains also hung at the ready from doors separating first and second class. I quickly retreated to our compartment, where the car attendant soon stopped by to explain that we should use the extra deadbolt lock to keep out the regular midnight burglars that plagued the border area between Hungary and Romania, and that we were to make sure that anyone who knocked on the door was a real border control official before opening up. Fortunately, the door had a peephole, and we had enough snacks and drinking water to last until our arrival. The Romanian border crossing was far more pleasant this time around, though still at an ungodly hour. When I responded in Romanian, the customs official asked where I learned it. I said I learned it in the US Army the first time around, then revived it later during a year a the University of Bucharest. He suggested that perhaps I had been a democracy activist. I protested that I had never done anything very useful with the language. For our return trip from Bucharest to Vienna on Saturday, we boarded the same overnight train (D 346) after stocking up on food and drink at a grocery store in the station. And we got the same lecture about securing our compartment door overnight, this time from a new car attendant with a new trick that employed a coat hanger. He also explained that the teams of burglars only infested the train between Curtici, where it stopped for Romanian customs, and Békéscsaba, the first station on the Hungarian side of the border. We survived the border crossing unmolested, but also unmoved. We arrived about 2 a.m. and spent most of 3 hours at a standstill, far more than the time required for the Romanian and Hungarian passport control. We finally got underway about the time we should have been arriving at Budapest Keleti, where we had missed the train that was supposed to pull our cars to Vienna. Instead of pulling in to the platform, we spent two hours waiting at a siding, periodically trundling to and fro in front of Budapest's new Arena Plaza. Our car attendant hibernated while the Keleti station loudspeaker blared forth long announcements, only in Hungarian, to otherwise empty platforms. I couldn't find a Hungarian speaker among the Romanian passengers to translate. So I finally walked up the tracks to the engine and asked the driver if he spoke Romanian, German, or English. He spoke just enough German to tell me that we would not be leaving until after 9 a.m., about the time we had been scheduled to arrive at Vienna and make our connection back to Strasbourg. The engine had had some kind of trouble. We finally made it into Wien Westbahnhof around noon on a sleepy Sunday. When we informed the solitary, unsympathetic clerk at the ÖBB travel desk that our train from Bucharest had missed its connection, she was not at all surprised. She said we would have to contact the DB, which sold us the reservations, to get any refund, and she gave us the choice of spending the next 20 hours changing trains and waiting in various German stations at ungodly hours, or boarding the real Orient Express for another overnight trip into Strasbourg. We chose the latter. How many people would resent having to spend 8 hours in Vienna on a Sunday? Well, we did. Almost every shop and restaurant on Mariahilfer Straße was closed. We wanted to treat ourselves to a nice long lunch, but nothing was open. The Russian Vladimir restaurant was closed until five, but we finally found a Greek restaurant, Mythos, run by an Egyptian couple with a cute 2-year-old boy who came around to our table to play with his retractable tape measure, whose housing functioned as a self-propelled vehicle. Thank goodness, once again, for the Mediterranean work ethic in Northern climes. The rest of the way back was uneventful. Service on the Orient Express was excellent, door locks were unnecessary, and our couchette mate was an Algerian man who spoke no German, but decent English and much better French than I did. It was nice to get back to Strasbourg, even though we had a rather long wait in Karlsruhe, to be unhooked from the cars headed for Amsterdam, and again in Kehl, to be hauled across the Rhine from Germany to France. I would love to make another trip to Romania, but not by overnight train. There is probably no such thing as a good purge, even if it is politely called lustration. The Czechoslovak lustration was prompt and crudely effective but deeply flawed by procedural injustice. The German "gaucking" has been procedurally more just: careful, individual, appealable. But it has sometimes been perverted by media abuse, and it has suffered from elephantiasis. Did postmen and train drivers really need to be gaucked? Again we come back to the question of who is doing it, for would the West Germans ever have done this to themselves? Yet Poland has shown the price of not purging. The Hungarians, with their nice habit of taking the German model and then improving on it, came up with a defensible refinement: It applied careful individual scrutiny only to those seeking senior positions in public life. But this was seven years late. Now Poland has finally followed suit, with a law that is probably the most scrupulous of them all. I believe the third path—that of history lessons—has been the most promising in Central Europe. Much of the comparative literature comes to a similar conclusion for other countries: What is somewhat biblically called "truth-telling" is both the most desirable and the most feasible way to grapple with a difficult past. This is what West Germany did best in relation to Nazism, at least from the 1960s on. What united Germany has done in this regard since 1990 has been exemplary: the parliamentary commission, the open archives, the unique opportunity for a very personal history lesson given by access to the Stasi files. To advocate the third path does, of course, assign a very special place to contemporary historians. In fact, I do think that if you ask "Who is best equipped to do justice to the past?" the answer is, or at least should be, historians. But this is also a heavy responsibility. Truth is a big word, so often abused in Central Europe during the short, rotten twentieth century that people there have grown wary of it. Studying the legacy of a dictatorship, one is vividly reminded how difficult it is to establish any historical truth. In particular, across such a change of regime, you discover how deeply unreliable is any retrospective testimony. Yet studying this subject also strengthens one's allergy to some of the bottomless, ludic frivolities of postmodernist historiography. For this is too serious a business. Carelessly used, the records of a state that worked by organized lying—and especially the poisonous, intrusive files of a secret police—can ruin lives. To interpret them properly tests the critical skills that historians apply routinely to a medieval charter or an eighteenth-century pamphlet. But, having worked intensively with such records and read much else based on them, I know that it can be done. It is not true, as is often claimed, that this material is so corrupted that one cannot write reliable history on the basis of it. The evidence has to be weighed with very special care. The text must be put in the historical context. Interpretation needs both intellectual distance and the essential imaginative sympathy with all the men and women involved—even the oppressors. But, with these old familiar disciplines, there is a truth that can be found. Not a single, absolute Truth with a capital T but still a real and important one. The intelligentsia—one of the characteristic phenomena of modern Central and East European history—is now everywhere engulfed in sweeping change. This world of "circles of friends," of milieux, where artists, philosophers, writers, economists, journalists all felt themselves to belong to the same group and to be committed to a certain common ethos (albeit often honored in the breach), was something anachronistic in late-twentieth-century Europe—but also something rich and fine. Its extraordinary character was summed up for me in a phrase that Ivan Klíma used in describing how he and his fellow writers had set out to revive the dormant Czech PEN club in 1989. "I was," he said, "authorized by my circle of friends." The peculiar world of the intelligentsia under communism was one in which you sought authorization from your circle of friends. Freedom has changed all that. With remarkable speed, the intelligentsia has fragmented into separate professions, as in the West: journalists, publishers, academics, actors, not to mention those who have become officials, lawyers, diplomats. The milieux have faded, the "circles of friends" have dispersed or lost their special significance. Those who have remained in purely "intellectual" professions—above all, academics—have found themselves impoverished. Moreover, it is the businessmen and entrepreneurs who are the tone-setting heroes of this time. Thus, from having an abnormal importance before 1989, independent intellectuals have plummeted to abnormal unimportance. For all the discontinuities of West German policy since 1949, one can but admire the grand continuity in which all chancellors from Adenauer to Kohl, all foreign ministers, all federal governments over forty years, now this way, now that, now in the West, now in the East, pursued the cause of German liberation. Historians will argue whether Adenauer's integration into the West or Brandt's Ostpolitik contributed more to the success of the past year. There is much to be said for the claim that the East Central European year of wonders, 1989, was a late triumph of Adenauer's "magnet theory"—the idea that the attraction of a free and prosperous West Germany embedded in a free and prosperous Western Europe would sooner or later draw the unfree and impoverished East Germany irresistibly toward it. But could the magnet have exerted its full attractive force if the blocking Iron Curtain had not first been drawn back by the Ostpolitik, which Willy Brandt launched in the late 1960s? And it was not Bonn's Western but rather its Eastern ties—above all, those to Moscow—that directly permitted the transformation of an East German movement for freedom into an all-German state of unity. The pioneers of social emancipation and democratization in the GDR were then overtaken rapidly by those who wanted to have done with the GDR altogether. By this time, the two parallel sets of negotiations for unification—the "internal" ones, between the two German states ("1+1"), and the "external" ones, between the two German states and the four post-1945 occupying powers ("2+4")—were already underway. To describe these seven hectic months of intricate negotiation would require not an essay but a compendium. The 31 August treaty on unification between the two German states is a book in itself—243 pages of small print in the official government bulletin. Formally, they were "1+1" and "2+4" negotiations. In practice, they were "1+1/4" and "1+1+1" negotiations. The first and last freely elected East Berlin government was not an equal partner in the German–German talks. The Bonn government basically set the terms of the internal unification, its officials drafting treaties that bore a remarkable resemblance to the finished product. Many East German politicians and intellectuals in both halves of Germany were understandably miffed by this procedure. "Anschluss," said some. Yet was it not for this that the majority of the people had voted in March? And, despite widespread economic distress, the majority expressed its basic satisfaction with the result, on 14 October , in the first elections for the five reconstituted Lander of the former GDR. Chancellor Kohl's CDU was the overall winner everywhere except in Brandenburg (where the Social Democrats' leader is a prominent Protestant churchman} and secured more than 45 percent of the vote in Saxony and Thuringia. The external negotiation was basically between the Federal Republic, the Soviet Union, and the United States, in that order. The Bonn government makes no secret of the fact that it was the United States, rather than France or Britain, that was its crucial Western supporter in the whole process. Washington was not just self-evidently more important in talks with Moscow but also more unreservedly supportive than London or Paris—a fact that has done some damage to the Franco-German "axis." Yet the central negotiation was that between Bonn and Moscow. In Moscow in February, Chancellor Kohl secured Gorbachev's assent to unification in one state. In Stavropol in July, he secured Gorbachev's assent to the full sovereignty of the united state, including its membership in NATO—although a NATO redefined by the "London Declaration" a few days before. Soviet troops would leave Germany by 1994. In [East Germany] at large, it seems to me, the real motto of the campaign—though no one, to my knowledge, actually used it—was Adenauer's slogan from the 1950s: "No Experiments!" They had experienced enough experiments to last several lifetimes: Hitler's experiments, Stalin's experiments, Ulbricht's and Honecker's. They'd had quite enough of being guinea pigs. There were certainly aspects of West German life and attitudes about which they had reservations. But so far as the economic, political, and legal system was concerned, West Germany's was the best one going. Arguably, it was the best system Germany had ever had. Now they wanted to have it as fast as possible: first the deutsche mark of course, but not just the deutsche mark, also the free press, the rule of law, local self-government, and federal democracy. In many ways, their priorities also recalled those of the 1950s in West Germany—starting with the passionate drive to rebuild for private happiness from the ruins. Understandably, the enthusiasm was greatest among the young, while the middle-aged were more worried about their abilities to adapt, and the old were concerned about the conversion rate and the values of their pensions. Indeed, the old might remark wearily, like the grandmother in Edgar Reitz's film Heimat, "Yet another new era!" On the last Sunday in 2007, the Outliers made a pilgrimage desultory excursion to Pfalzgrafenweiler, in Baden-Württemberg, whence Mrs. Outlier's paternal ancestors emigrated via Odessa to Russia (now Ukraine) around 1800, then later to the Dakotas around 1890. This devoutly religious and devoutly rural line can be traced back to Pfalzgrafenweiler from as early as the 1500s. Pfalzgrafenweiler itself goes back at least to Count Palatine (= Pfalzgraf) Hugo II of Tübingen, whose Pfalzgrafenburg there was stormed and razed by a Welf (= Guelph) Duke (= Herzog) of Bavaria in the 12th century. There is also a Herzogweiler within the Weiler Wald portion of the Schwarzwald (Black Forest), which is now a getaway spot for the lumpen as well as the grafen. Weiler can nowadays be translated 'hamlet', something smaller than a Dorf 'village', and there are many such placenames stretching far out along both sides of the Rhine, from Basel to Cologne. The equivalent in Alsace and Lorraine is usually spelled -willer (as in Bischwiller, Dettwiller, Ingwiller) or -viller (as in Abreschviller, Guntzviller, Hartzviller). The Alemannisch equivalent is -wiiler. Although related to villa, ville, and village, the term is an early Germanic borrowing from Romance wilare or villare, indicating farmsteads attached to a villa, not the villa itself. On Saturday, we had made a trip across the Rhine to the Deutsche Bahn (DB) travel desk in Kehl to find out how to get there and buy tickets. (We had not yet initiated our 15-day Eurail Passes.) Despite being just over the border from Strasbourg, France, the DB rep forced his customers to deal with him only in German or English. I chose English after watching the poor Francophone ahead of me struggle along in German no better than mine. The Kehl to Offenburg leg reminded us a bit of the JR Ryomo line we used to take between Oyama and Ashikaga along the foothills north of Tokyo, while the Offenburg to Freudenstadt leg reminded us more of the scenic Keikoku line running up the upper Watarase River gorge from Kiryu toward Nikko. Along the way to Freudenstadt ('Happyville'), the train passed a number of stations whose names ended in -ach (not -bach 'brook', but related), meaning 'watercourse' and ultimately cognate with Latin acqua: Biberach 'Beaver Run', Steinach 'Stone Run', Haslach 'Hare Run', Hausach 'House Run', Wolfach 'Wolf Run', Schiltach 'Shield Run'—but, alas, no Bullach. In the local Alemannisch dialects, the final consonant is lost and the vowel reduced, thus: Biebere, Steine, Hasle, Huuse, Wolfe. Freudenstadt is roughly comparable in size to Aberdeen, SD, but is even sleepier on a Sunday. The tiny railway station is on the edge of town and lacks even a public toilet. When I followed the arrows on a wall map, I ended up at a port-a-potty in an isolated (and unheated) area nearly 100m from the station. 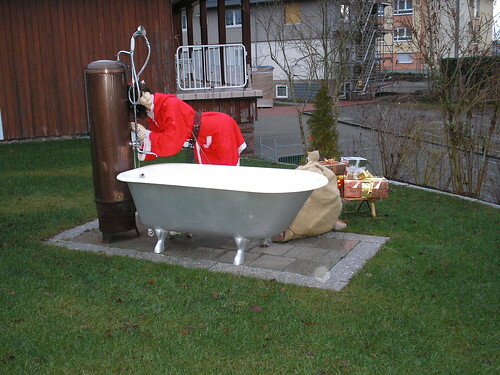 (At least I didn't have it as bad as Santa did in Pfalzgrafenweiler, where he had to bathe outdoors.) To its credit, Freudenstadt station had a gift shop full of snacks, souvenirs, magazines, travel info about far corners of the globe, and a very impressive collection of cigars for sale in a specially humidified room. We had left my brother's house in Strasbourg a little before 9 a.m. The bus dropped us at the Pfalzgrafenweiler Rathaus at 2 p.m., just as the town went into its deepest Sunday siesta. The local pizza delivery shop had finished its last run. Even the local kebap shop had closed. We walked the silent, empty streets meandering uphill toward the highway, where we found EverRast, a combination truck stop, restaurant, and internet café that was just about the only happening place in town on a Sunday afternoon. We ordered German-style salad plates and sampled the local Alpirsbacher Klosterbräu. The friendly waitress looked African American and switched easily between English and German. It was already getting dark by 4 p.m. as we meandered back toward the bus stop for the 5 p.m. bus. We had just enough time to snap a few more photos, then stop in at Thome's Schwanen hotel and restaurant, which was just opening for the Sunday dinner crowd. We asked the gracious hostess for a telephone book and snapped a photo of the handful of listings for Mrs. Outlier's family name. Most of the telephone numbers had only 4 digits. It was too dark to enjoy the beautiful scenery on the way back, but we had just enough layover time in Offenburg to explore of few of its cold, empty streets. The only warm, bright spot near the station was the Turkish-run Imbiss Stube. Thank goodness for the Mediterranean work ethic. We ordered hot lentil soups and hot spiked teas. The menu offered not just kebap, pizza, and pide, but also Seele (calzone), which (misleadingly or not) belatedly made the connection for me between Italian calzone and Romanian încălţăminte 'footwear'. Labels: family, Germany, language, travel, U.S. The single most important country in Pétainist imagination was the United States. The Rue des États-Unis ran past the Hotel du Parc and, unlike some Vichy streets, it kept its name throughout the period from 1940 to 1944. France's self-image in the inter-war years had often been defined in contrast to America. Pétainists had often seen Americanization as a threat to French traditions. Pétain's adviser, Lucien Romier, had published a book in 1927 entitled Who Will Be Master, Europe or America? Yet after 1940 Pétainists knew that America mattered hugely to their country. It was the most important of their diplomatic partners. It mattered, first, as a source of food and then as a potential broker of a compromise peace (a few at Vichy continued to believe in the possibility of such a peace until the summer of 1944). The American embassy in Vichy was a strange place and became all the more so after Hitler declared war on the United States in December 1941. Men such as 'Woody' Wallner, and 'Doug' MacArthur II, the nephew of the general, spent their time swimming, playing tennis or drinking cocktails. Wartime Vichy was excruciatingly dull for east coast patricians who had spent most of their career in European capitals. After April 1942, the embassy was run by Pinkney Tuck, the chargé d'affaires. Tuck, a career diplomat, was a conservative and seems to have been anti-Jewish (he opposed American recognition of Israel). However, like many French anti-Semites, Tuck was appalled by evidence of Nazi atrocities against the Jews in the autumn of 1942 and tried to get American visas for Jewish children in France. His efforts were thwarted by the German invasion of the southern zone. By the time the Germans arrived at Vichy, the American embassy contained only a couple of junior officials who had been left behind to shut up shop before being interned in Baden-Baden. It is probably wrong to look for much ideological coherence in American attitudes to Vichy. The general tone of American policy can be deduced from the code names that Americans used for French affairs: Pétain was 'Popeye', Laval was 'black Peter' and France in general was 'the Frog pond'. American policy was mainly directed towards the practical matter of ensuring that French resources were not deployed against the Allies, and bolstering what the Americans took to be anti-German elements at Vichy. To this end, they sent William Leahy, a sixty-four-year-old admiral, to be their ambassador to Vichy. Leahy was a brisk conservative who spoke almost no French and judged men mainly on whether or not they looked their interlocutors in the eye. Leahy's particular concern was to prevent the remainder of the French fleet from falling into German hands. The Americans also wished to persuade some eminent French figure to establish an anti-German government in French North Africa and, initially, they hoped that Weygand might undertake this task. Alsace-Lorraine and Belgium were Catholic [perhaps Vinen meant devout, as Alsace was confessionally quite mixed] whilst the south-west of France was anti-clerical. Alsatians and Flamands spoke languages that sounded like German, which aroused suspicion in the paranoid climate of 1940. As early as April many claimed that people from Alsace-Lorraine were celebrating Hitler's birthday or that refugee trains from the east of France had been decorated with swastikas. The de facto annexation of Alsace-Lorraine by Germany in July made the status of people even more uncertain (though, in the long run, people from Alsace-Lorraine who chose not to return home came to be seen as French patriots). The Belgian king's surrender made the French suspicious of those of his subjects who had fled to France—though many of those subjects were now violently hostile to their own government. Looting was widespread. Refugees stole things as they moved through deserted towns. Sections of the French army looted on a grand scale in the abandoned areas of eastern France where they were stationed.... Sometimes looting was recognized as necessary for survival when there were no conventional means of obtaining supplies. In Reims, the municipality summoned a locksmith to open abandoned shops. Sometimes shopkeepers left their properties with the doors open and invited refugees to help themselves. Sometimes the privileged took advantage of their positions: the mayor of the village of Epehy in northern France was found to have hundreds of thousands of francs' worth of 'requisitioned property' in his house. On other occasions crimes were committed by people who had no other means of obtaining food. A large proportion of crimes during this period were committed by housewives and also by adolescents, perhaps those who had lost contact with their families. Courts, both those operated under Vichy and those operated after the liberation, seem to have recognized that crimes committed during the exode often involved otherwise 'respectable' people.